These are the last of the photos from the photography workshop this past weekend. I’m not really sure what the above vehicle is other than it is some type of 4×4, probably military at one time. It caught my eye as we were leaving the property. 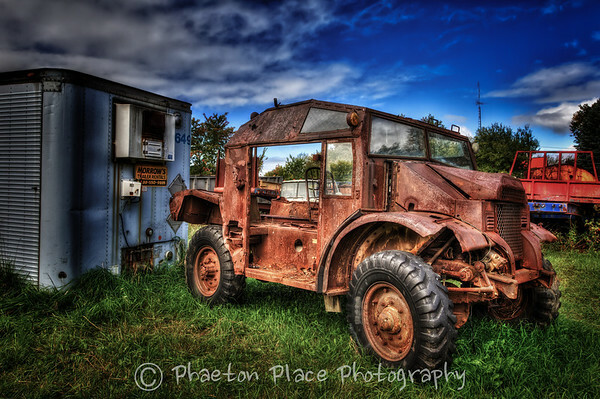 Something about seeing a rusty old warhorse of a vehicle juxtaposed on bright green grass and against a blue sky. Three photos again combined using Photomatix Pro and then processed in Photoshop CS6 using Nik’s Color Efex Pro plugin. This next one grabbed my attention because of the broken vent window which I thought would look good in HDR. Quite a bit of detail in the cracked glass. Yours truly has been hit with a good head cold. Happened yesterday but I’m hoping it will be short lived. Chris is loading me up with vitamin C and oregano oil in water and I think it is working. Sniffles are still there but the congestion is gone already. Teddy & I spent the day at home while Chris went for lunch with a couple of girl friends in the park. I managed to sort through my closet and now have a nice pile of clothes to add to Chris’s pile of clothes for good will. Hard to believe the clothes we have both accumulated since beginning this lifestyle. Our next step is to empty out the entire storage area under the motorhome in an effort to reduce the amount of stuff we are hauling around with us. Some of it gets used regularly while other things are seldom used. Anything we don’t use regularly will go to storage or to good will. Space is limited even in a 42 foot motorhome and we can’t have things with us that aren’t being used regularly. We let our satellite internet contract with Galaxy Broadband expire today. We’ve been using them for satellite internet for the last two years but during that time mobile internet via cell phone companies has really taken over and surpassed satellite internet in my view. Frankly, the value for money just isn’t there with satellite internet. Speeds are very slow and daily download limits are miniscule compared with other services available in both Canada and the USA. Elsewhere in the satellite technology field for RVing, our satellite TV service is with Bell. We receive plenty of HD channels while in Canada but lose the HD channels once we get further south than Pennsylvania. We still get all our channels while in the USA but only in standard definition. Recently, we have learned that Bell has once again realigned it’s satellite so that very little of the footprint now extends into the USA. Bell has always been touchy about users receiving service south of the border but now it seems Bell is upping the stakes by virtually eliminating their footprint south of the border. There are plenty of reports on the internet of Bell users’ service being cut off if Bell should find out their service is being used outside of Canada. My internet research reveals confusing results though as apparently Bell users in Florida at the present time are still receiving the same standard definition reception with Bell as they did before the most recent satellite realignment. We thought about going with Shaw because they are a little more tolerant of customers using their service south of the border but apparently Shaw may be realigning their satellite footprint within the next year, in a similar fashion to what Bell has already done. Bottom line, we don’t know what to believe so we are going to stick with the status quo for the time being and go south with our Bell satellite. If we lose it, we lose it. 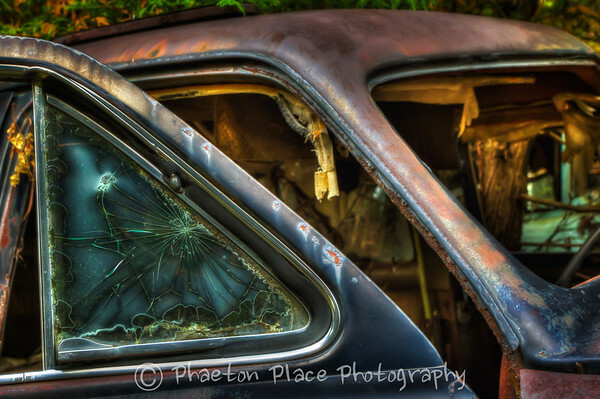 This entry was posted in HDR, Ontario, Phaeton, Photoshop, Satellite TV, Technology. Thank you Mark. This info is very helpful.. The dilemma for us in regards to internet service has always been finding the best service for our needs while we are in Canada. We went with satellite internet in 2009 when we purchased this motorhome primarily because there were not a whole lot of options for truly mobile internet north of the Canada/USA border. Cell phone data service only worked in mid size to larger towns and cities and cell phone data plans were very expensive three years ago. Galaxy Broadband is the Canadian distributor for HughesNet satellite internet. Satellite internet costs us about $75/month which gave us a rather paltry 250MB download daily between 7 am – 2 am and unlimited downloading between 2 am – 7 am daily. It is not the fastest service by any means but satellite internet did give us internet anywhere provided we had an unobstructed view of the southern sky. There was also an annual charge ($75 I think) for a CRTC transmitter license. While in the USA we rely on our Verizon 4G LTE mifi which gives us 20 GB/month. We can connect up to ten devices to the mifi and even more if we choose to use a router. Presently, while in Canada we are relying on the slow wifi at our campground but it is enough to get us by until we head south on Nov 1st. We also each have the new iPhone 5 with Telus which gives us 400 min calling (way more than we need), favorite five (now ten) numbers at no cost, unlimited text and MMS anywhere in North America, voice mail, and 6 GB of data that lets us tether our phones to our iPads or laptops. So we have a combined 12 GB of data to use every month through Telus which should be more than enough for our needs. Cost is $75/month for each phone plan. Other Canadian cell phone providers offer similar packages as well. When we head south we shut off our Telus accounts which lets us keep our phone numbers but drops our monthly bill to $10 each. We reactivate when we come back north and always get a good plan from Telus Customer Service. For the past few years in the USA we have been using a pay as you go Tracfone for telephone service which has been pretty good but offers no data service at all. This winter because we have the new iPhones we may look into getting USA service for the phones by purchasing a USA based nano SIM card from either AT&T or T Mobile. Both AT&T and T Mobile offer pay as go options with both phone and data service for unlocked iPhones. We were in England for a month this past summer and used O2 mobile service to buy SIM cards for our iPhones and my iPad. Cost us each about $10 per phone and iPad for the entire month and we had a local UK phone number with internet service almost everywhere we went, except of course in the more rural areas. But even in the rural areas we were rarely without service. North America seems to be in the dark ages when it comes to pay as go phone and data service, preferring to instead tie customers to ridiculously bloated 2 and 3 year contracts. But things are slowly evolving so perhaps we’ll see some progress in this regard fairly soon. I may do a post on this subject in the coming days. Please let me know if you have any more questions. Which server are you planning to use for internet. While in PEI we relied in the camp ground service, which was the pits. Se we think we should use another system as we rely on the internet for everything.